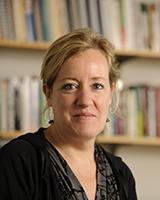 Lori is an associate professor in the Department of Development Sociology at Cornell University and Director of the Polson Institute for Global Development. She teaches courses on gender and development and was a long-time board member of the Program for the Study of Women, Gender and Sexuality at the Johns Hopkins University. Gender and the gendered impacts of development projects are cross-cutting themes in her research, which is based primarily in Chad. As a GREAT trainer, she will be involved in the session on gender and development and the session on assessing the validity of research data.